The Working With… Podcast | Episode 57 | How To Stop Procrastinating. 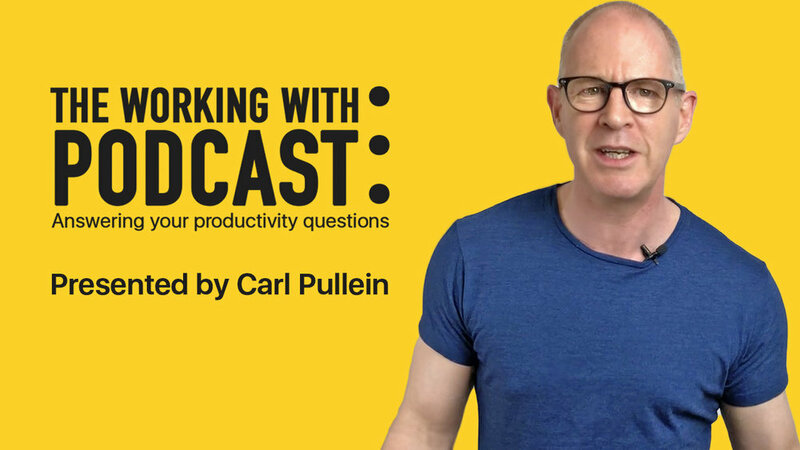 In this week’s episode of the Working With Podcast, I answer a question about how to stop procrastinating and get the work done. Hello and welcome to episode 57 of my Working With Podcast. A podcast created to answer all your questions about productivity, GTD, time management, self-development and goal planning. My name is Carl Pullein and I am your host for this show. This week, the question is all about procrastination and how to overcome this real productivity conundrum. It affects us all and it can do a lot of damage to our careers, relationships and goals. But before we get into this week’s question, I want to tell you all about my fantastic Black Friday / Cyber Monday sale. There are some fantastic offers available for you and I would love you to get yourself a bargain while you can. I have bundles of courses, including the brilliant Pathway To Productivity, AND… I am also offering 12 Months of weekly one on one coaching with me personally at half price. Those places are very limited, so if you want to get yourself in, you need to go to my website right now and book yourself a place and save yourself $600! Okay, on to this week’s question and that means it’s now time for me to hand you over to the mystery podcast voice, for this week’s question. This week’s question comes from Tim. Tim asks, Carl, I really struggle to get things done. Whenever I sit down to do some work I find myself procrastinating by flicking through Instagram or watching your videos on YouTube. Do you have any advice on stopping this? Thank you, Tim, Not sure I want to stop you watching my videos though! Anyway, to answer your question this is something I know many people have difficulties with. I too, from time to time, find myself procrastinating and it can really hinder the work I want to do for the day. The good news is there are a few strategies you can use to stop you from flicking through Instagram, Twitter or Facebook. The first one is to have a plan for the day. We often find ourselves procrastinating when we have unclear plans for the day. If you turn up to work with no plan you will spend the first part of the day thinking about what to do and that is when social media and unimportant work shouts the loudest. It’s human nature to turn away from the hardest work and move towards the easier work. If you have no plan, the unimportant will be shouting at you and you will not do the important. This is one of the many reasons why I recommend you do the Golden Ten at the end of the day and not in the morning. When you wake up in the morning with a clear idea of what you want to accomplish that day you are much more likely to get it done. And that leads me on to the second tip. Don’t set yourself too much to do. Another reason why we get drawn to procrastination is because when we look at our to-do list for the day it is too long. It becomes overwhelming and overwhelm often leads to procrastination. I have been recommending that you do not have more than ten things on your daily to-do list each day for a long time. Now that might not seem very much, but every day you are going to have crises, demands from bosses and customers and you are going to have to deal with them. If you only have ten or fewer items on your to-do list you will have time to deal with the crises as well as get your planned work done. That creates a circle of success. The more days you complete your planned tasks, the more focused you will become on completing those tasks. It’s a case of you not wanting to break the chain and you become determined to get your work done. These tasks are easy, clear and manageable. You are much more likely to get them done rather than waste time thinking about what to do next. Another way to help stop you from procrastinating is to make good use of labels or contexts in Getting Things Done terminology. What this means is you label each task according to the tool, place or person required to do the task. For example, if you need to be at your computer to do a task, you would label it @computer. Likewise, if you need to be with your colleague to find something out, then you would label the task @colleague’s name. Shopping tasks can be labelled @supermarket and so on. This way, when you find yourself in front of your computer you pull up the list of tasks you need your computer for and get started. Now of course if you are using my Golden Ten system you would move on to your labels AFTER you have completed your ten tasks for the day. Another trick I’ve used in the past that works well is to schedule breaks between the work I am doing. For example, I know in a morning I am good for around two hours. So, every two hours I will get up and walk around. Refill my water bottle or check my email. I limit these break times to ten minutes and if you are a serial procrastinator I would suggest you set yourself a ten-minute alarm. You can check your email from your phone, so you can walk around and check email via your phone. If you want to scroll through your Facebook, Twitter or Instagram feed during these times then do so. It’s a break remember. BUT… After ten minutes get back to work. In the afternoons, I find my attention span reduces so I take breaks every hour or so. This really works, particularly if you are following your plan for the day. When you have a plan you know exactly what you will get to work on once your break is over. Having all your information organised is another way to avoid procrastination. When the information you need to do your work is scattered all over the place you go in search of it. This will take you down avenues you do not want to go down looking for files. I group reference materials and files in project-specific folders (or notebooks in Evernote) I also copy and paste website links into the project note for the project in Evernote so I don’t have to open up my web browser blind. All I need to do is click on a saved link and it will take me to the page I need to reference. Not only does this save a lot of time it also keeps me focused on the task at hand. Turn off your notifications and silence your email when you are doing your important work. This one is a biggie. If you are working on a report, presentation or design and you keep getting pop-ups telling you-you have new email, or a new Twist or Slack message you are going to be tempted to look at it. STOP! No, No No! - This is going to cause you a lot of pain AND you WILL procrastinate. Turn them off and focus on the work. You can check your messages and emails between your work sessions. Seriously, no one is ever going to get upset with you if you don’t reply for an hour. If something was very urgent, they would call you. So there’s no excuse at all not to turn off your notifications. Do it… Just do it. No excuses. There’s a couple of other ways to stop procrastinating. The first is to gamify your work. Give yourself a reward for focusing on your work for an hour (or ninety minutes if you prefer) Allow yourself ten minutes on Instagram if you complete a piece of work or spend two hours on focused work. Gamification is fun and you not only get to check your social media feeds you also get a lot of work done. After all, work doesn’t have to bring and serious all the time. Finally, if you are in the habit of checking shopping sites randomly while you are working then set up your to-do list manager to collect from a keyboard shortcut. Recently I have been redesigning my home office and I have been looking at office chairs, hard drive storage solutions and plants for my desk. Often as I am writing or planning I get an idea to check Ikea or a furniture store’s site. To avoid me going off on a shopping expedition, I will use my quick capture keyboard shortcut to Todoist to collect what it is I want to look at and carry on my work. I write and plan in full-screen mode on my computer, so I never leave the screen I am working in. It’s just SHIFT+CMD+A and I type “look up office chairs at Ikea” and hit return. Done. My thought was captured and I can carry on planning or writing. I can then look up whatever it is I wanted to look up when I take my next break. Well, I hope that has answered your question, Tim and I hope it will help you to overcome your procrastination. I know procrastination is a problem for many people, but if you adopt these strategies you will soon find yourself getting more important work done and procrastinating less. Be clear about what you want to get done, schedule regular breaks and turn off your notifications when you are doing focused work. These three strategies alone will help you. But the biggest one of all is to discipline yourself. Procrastination is really a sign you have a lack of discipline. Work on your discipline, and to do that start small, and you will go a very long way to stopping procrastination from rearing its ugly head. Don’t forget to check out my Holiday season offers, I am sure there will be something there for you all.